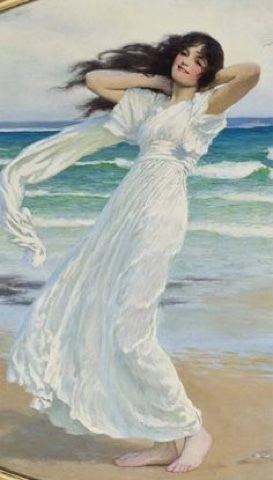 Margetsen (1861-1940) probably was not promoting beach fashion for women, but his paintings say a lot to some of us who are wanting to look pretty at the beach. 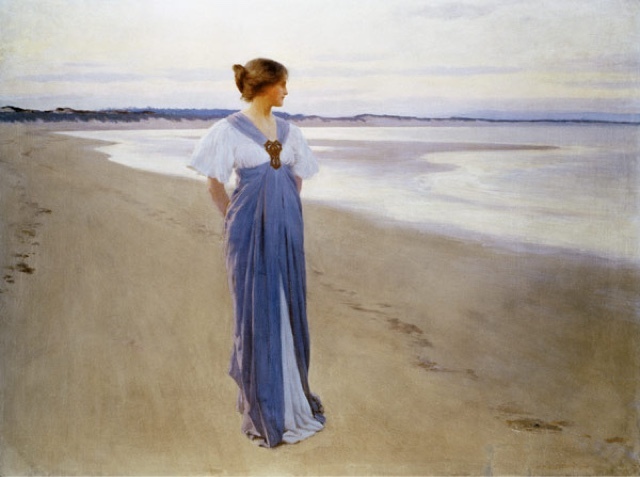 We do notice other things in the paintings, but today I am looking at better ways to dress for a visit to the beach. Also, please notice how similar the hair styles of the paintings are to the natural up-sweeps and loose curls of the current decade. Of course I am not referring to swim-wear, but beach wear, for those who just want to walk on the beach or sit and look at the ocean or engage in activities other than swimming. So this post is not about swim wear or sports wear. I mention this because of the inevitable comments I get telling how you can't run a race in these dresses. This isn't about scaling the sand dunes, riding a horse, hiking or boating. It is about leisure wear for ladies who want to wear something soft, feminine and pretty in a slower way of life; to wear for a low impact trip to the sea shore. Does not dressing for a visit to the beautiful sea shore deserve as much consideration as other events? In my opinion a trip to the beach is a memorable event, and we create the memories in many different ways. We do not want to overlook clothing in creating memories. I for one, like to mark the evet by a special dress, which I make. Others may do this differently but it is an important part of life to get a special garment for a special occasion. 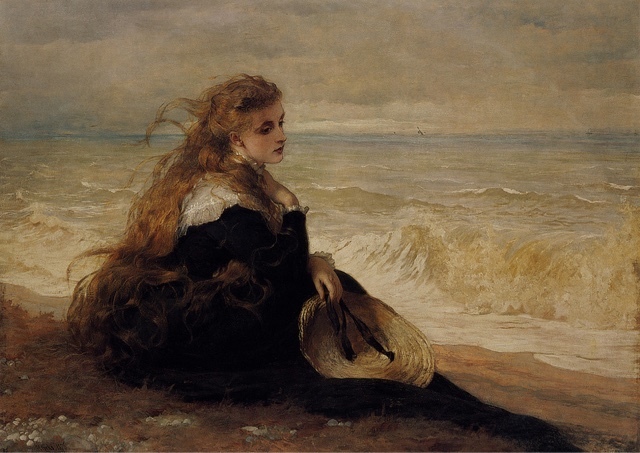 The Seashore, by William Henry Margetsen. 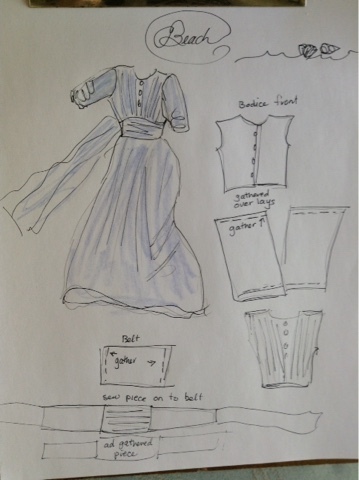 As far as clothing design, I am not too keen on The Seashore dress, because the brown piece that joins the collar to the skirt is not familiar, although it may have been a style of the 1930's. It looks like a lenghth of fabric that is wrapped around into a skirt and then joined in the front with a clip. 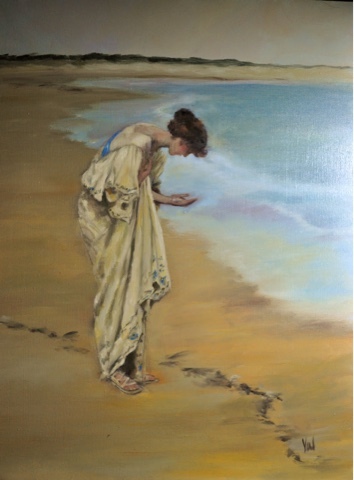 I do not know for sure if the above painting is by Margetsen but when a teenager, I always thought it was quite a pretty sight when ladies sat on the beach with shawls around them, watching their children play. I always wanted to sketch such scenes. 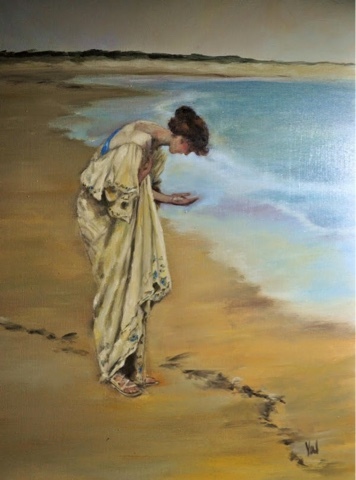 Below: another painting by Margetson (not sure of the title). 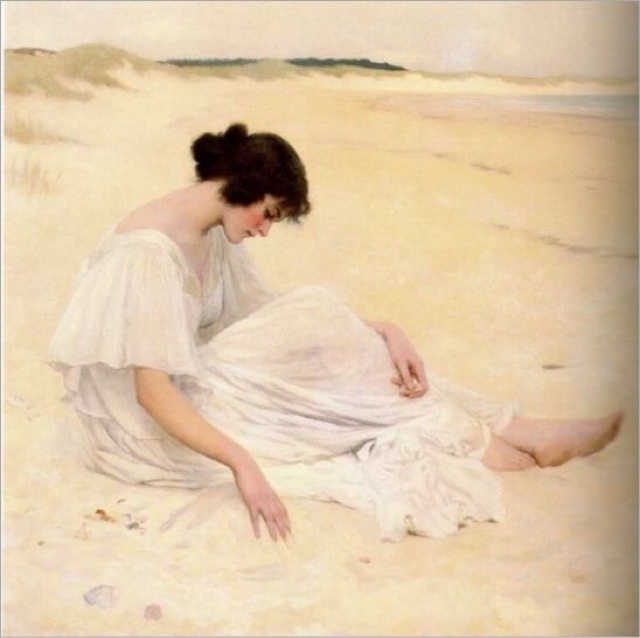 This one, below is called "Castles of the Sand" by William Henry Margetsen, and it is these two dresses I want to immitate in sewing a dress for the beach. I am not sure where the scarf that is shown blowing around on the left is coming from on the garment, (above) but it may be from a wrap around waist band. I won't be using it. As I get busier (and older) I like simpler garments without too many fussy accessories. Scarves, ruffled sleeves and too full of skirts get in the way. 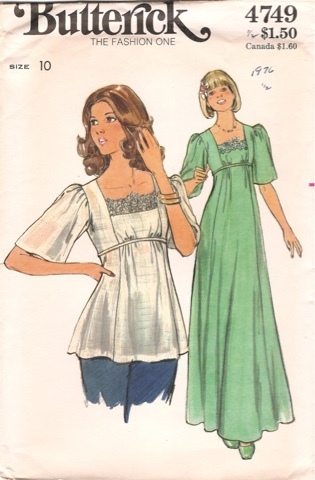 In the 1980's there was a pattern that had gathered over-lays on the bodice front and back, which were quite simple to sew. I keep looking for this pattern but could easily do it with gathered pieces, which I have shown here on my planning sheet. I saw this 1970's pattern on the web, and although it is hard to find, I thought it was similar to the Margetsen paintings of the white dresses. I think it would look good in pastel shades. Summer clothing is not just applicable to the beach, for there are many opportunities to look nice all summer, whether going about you business in town, working at home, or going for a walk. Ladies I continually think of coming here on video as well as Housewife Radio but lately my house is full of noise due to some repair work going on, and it is quite a mess, as things from several rooms are put in other spaces to make room for all the changes. It is taking a lot more time than I anticipated as we are doing a lot of it ourselves and we have to stop often for other things in daily life. However, I am getting close to making a video and you might even see one to go with this post. I appreciate your donations and your comments and your kindness in coming here to this blog. The garment in the above painting looks like a caftan, with embroidery on the borders. Caftans and Hawaiian mu-u-muu dresses were some of the most elegant ethnic clothing in the past but both got bad press here, which discouraged women from wearing them. People who wanted to undermine this fashion began to spread around that it was only for women who had nothing else to wear, or who were hiding their weight gain, or who didn't care how they looked or that only prudish women obsessed with modesty would wear them. I do remember the caftan and mu-u-mu very kind to the full figure visually, and comfortable in hot weather when other things might feel restrictive, and some women did indeed have nothing else to wear that fit them as well. However, they were still beautiful garments worn by women, young and old, thin and ample, and it is too bad women do not feel free to wear them as commonly as they once did. If you will look at the caftans worn by royalty in places like Ethiopia you will see just how elegant these loose dresses are. Most of our mothers had these garments but they were not widely available by the time we had grown up. These dresses were a welcome change from the dresses of the 1950's because they were so much easier to sew. I had the mumu ...the last pattern you show...and did it in the blue and white stripes..sleeves...just like the pattern. I think I finally disposed of both...sad to say , now. After making mine, I discovered it was quite heavy, making it uncomfortable to wear...so I advise our ladies to choose a LIGHT-WEIGHT fabric for this sort of style. I had used a light- weight DENIM - a bad choice! My mother was in love with anything Hawaiian and when I was twelve she bought us each a muu-muu. I loved it and wore it for two years until it faded and went thread bare. Wished I'd had the pattern. The hair and clothing styles in the paintings resemble the Greek Revival era and most of the clothing was very soft, flowing and loose. Very feminine too. Thank you for sharing. I love your dress drawing and would so much like to see it before your beach trip. Please do show it on post. 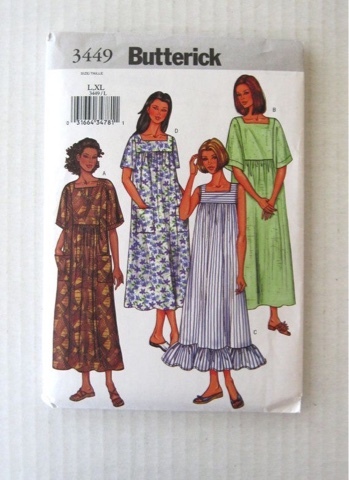 One summer my mom and I sewed bathing suit cover-ups like the lime green dress in the pattern. We used three light weight terry cloth bath towels. One across the top with a slit in it for our head, and two more towels for the back and front bottom, sewn empire style. A drawstring around the highwaist tying in the front and the sleeves were angel wing style. No hemming except for the neck slit. I don't see why one couldn't use a 45" or narrower) piece of cotton fabric and do the same thing. You might need to hem the sleeves and bottom of the skirt part, but it would be light and airy for a summer beach trip. Maybe a 1" or 2" sash to bind up the updo for the hair from the same fabric or a pretty wide ribbon. I found a link to resizing patterns to larger or smaller. Hope this is helpful to those who held onto their 1960's- 70's dress patterns and still want to use them again for pretty feminine clothes.